Slant Eye For The Round Eye: Meiko + Marié Digby: One Picture Is Worth A Transcribed Interview? Coming Shortly? Meiko + Marié Digby: One Picture Is Worth A Transcribed Interview? Coming Shortly? 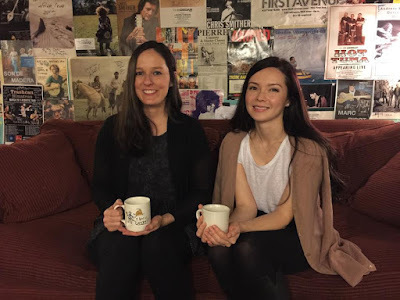 I wanted to post this picture of musicians/artists/singer-songwriters, Meiko, and Marié Digby, who passed through my neck of the woods on the Hapa Tour, and sat down with me to talk for an interview at the Cedar Cultural Center. Sometimes it's just nice to listen about what other people are doing in the AAPI community and it was great to hear about the Tour, what they were both doing afterwards, and just to get know a little more about each of them as people and as artists.